Karabakh's autonomy within Azerbaijan "out of the question"
PanARMENIAN.Net - The status of Nagorno Karabakh as an autonomy within Azerbaijan has never been and will never be discussed during talks on the settlement of the conflict, Armenian Foreign Minister Edward Nalbandian said Wednesday, June 29. Nalbandian met with the OSCE Chairman-in-Office, German Foreign Minister Frank-Walter Steinmeier in Yerevan. The diplomats then gave a press conference on the outcome of the meeting and answered the journalists' questions. 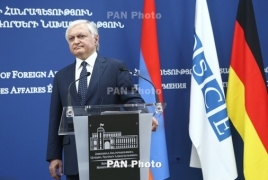 In response to a remark on Azerbaijani President's declaration about discussions of Karabakh's autonomy, Nalbandian said that Baku, as always, tries to pretend to have benefited from the arrangements. Armenian President Serzh Sargsyan and Azeri leader Ilham Aliyev met on June 20 in Saint Petersburg to address the conflict, with Russian President Vladimir Putin mediating the talks. The Armenian and Azerbaijani presidents confirmed their commitment to the implementation of agreements reached at a Vienna-hosted meeting on May 16. To that end, they have agreed to increase the number of international observers in the Nagorno Karabakh conflict zone. Also, they expressed satisfaction that the ceasefire was now holding. Prior to that, a meeting between both leaders was organized on May 16 in Vienna, with top diplomats from the MG co-chairing countries hosting the summit. Nalbandian reminded of the OSCE Minsk Group Co-chairs' multiple declarations according to which the Karabakh people are in charge of deciding their final status. According to the Armenian diplomat, the parties discussed bilateral ties, EU-Armenia relations, with Nalbandian stressing Armenia's appreciation of Germany's role in the efforts of settling the Karabakh conflict as an OSCE chairing country. Weighing in on his upcoming visit to Azerbaijan, Steinmeier said everything should be done to avoid the recurrence of the hostilities of early April. Azerbaijan unleashed a four-day war against Nagorno Karabakh on April 2. The hostilities claimed dozens of lives on both sides including among the civilian population. A verbal agreement on the cessation of hostilities was reached on April 5 in Moscow. Asked about his support to the resolution of the Genocide recognition, as well as his ultimate failure to pronounce the term genocide, Steinmeier said: "I haven't used the term because I have supported the resolution. We are confident that relations between Armenia and Turkey must be mended as soon as possible." The German Bundestag on June 2 adopted a resolution on the recognition and the condemnation of the Armenian Genocide. The vote was unanimous in supporting the resolution with just one MP voting against and another one abstaining.